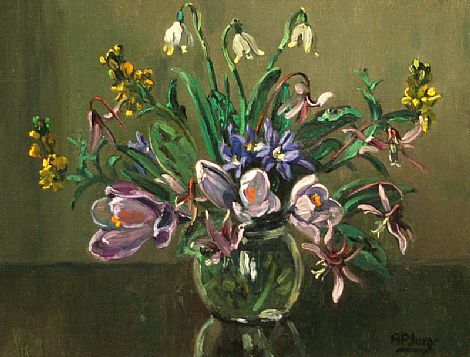 (1907 - 1995) Anne Primrose Jury RUA was born in Co Antrim and was a flower, landscape and animal painter. ‘Nancy’, as she was familiarly known, studied at Belfast School of Art and in England, France and Switzerland. 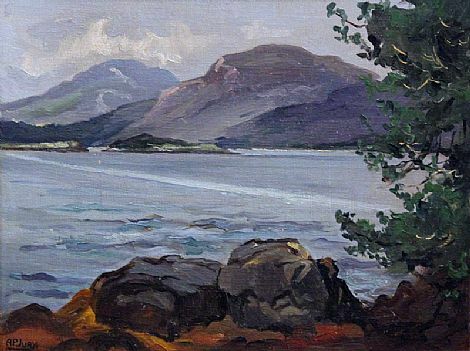 She was a tireless worker all her life for the Ulster Society for the Prevention of Cruelty to Animals and bequeathed her painting “Donkeys” to the Society. She went to live in Dunfanaghy, Co Donegal in 1987. Outspoken, boundlessly energetic, she was a distinctive figure and she died at hospital in Letterkenny in 1995. A studio sale took place that year in Belfast and the USPCA benefited.